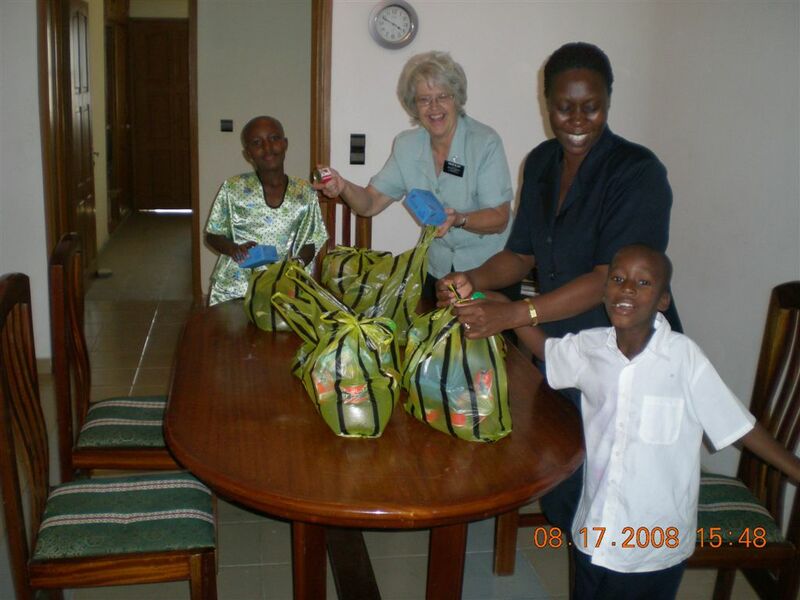 President Desire and Soeur Felicite, the Relief Society president, decided that the Branch needs an effective way to distribute small sacks of food to the needy members. There is a definite need here, and thus far President Desire has given people money from the fast offerings to purchase food. There is no Bishop’s Storehouse here so we have no access to church commodities. On Wednesday the first mini Bishop’s Storehouse in Cotonou was opened in our apartment which made for a very interesting day. No ribbon cutting or ceremonies, we just picked up Soeur Felicite and headed for Tokpa Marche. The first stop was at an importer of rice. There was rice of every kind and description piled high in 50 kilo sacs everywhere. I even saw a few sacks that had Merry Christmas on them. Now what kind of rice is Christmas rice? Could it be long grain, short grain, parfum rice, par-boiled, extra short grain and the list goes on. As for the Merry Christmas rice, I guess we will never know. After a little negotiation, two 50 kilo sacks were loaded in the back of the pickup. 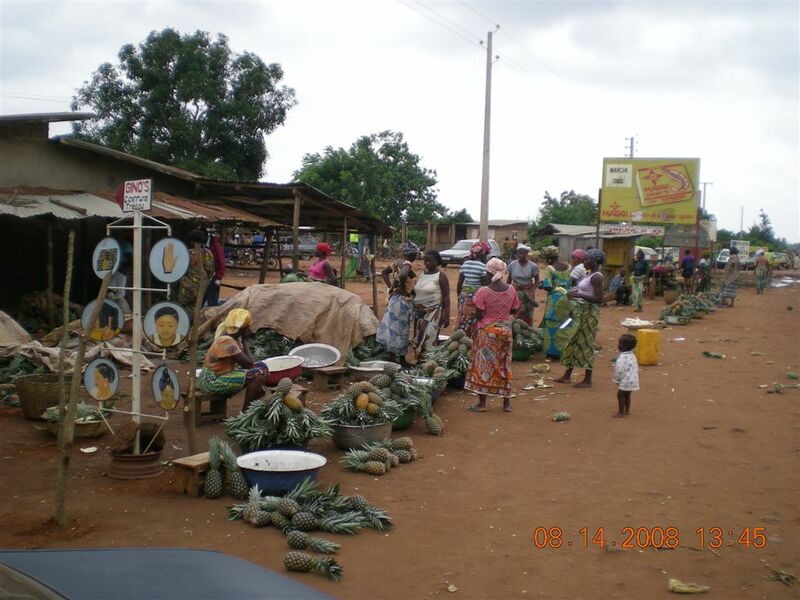 Then we went to a congested part of the market to buy tomato paste, oil, canned corn beef, sugar, and powdered milk plus the plastic sacks to put the food in. 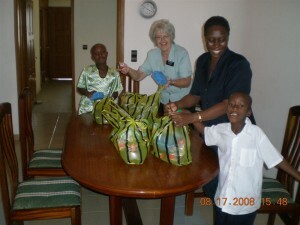 After more negotiations, our mission was accomplished, and we went to our apartment to assemble the sacks. We ended up with 24 complete sacks and 10 with rice only, plus rice all over the floor. Soeur Felicite’s two children, Lillian and Hendrick helped and we had a good time especially when we could keep Hendrick focused. He seemed to be more interested in looking at pictures on the computer than helping to bag rice. I guess kids’ attributes don’t change with the color of their skin. Last week we had so much fun with the pineapple we decided to make another “pineapple run” this week. Since we go to Calavie to teach each week, we went on up the road about 30 minutes to where we attended the funeral last week and loaded up with pineapple again. There are a number of sellers by the side of the road at a pineapple marché and as soon as you stop, you are immediately besieged by 8 or 10 all wanting you to buy their pineapple. How do you choose which one to deal with? I don’t know, but there seems to be a kind of a code of ethics that as soon as you start seriously talking to one the rest pretty much disappear. Up until that time it is largely pandemonium. 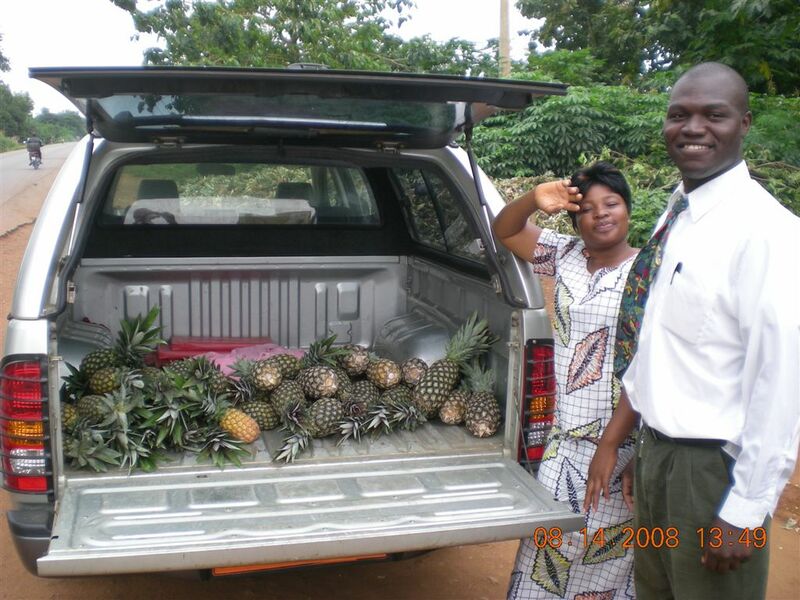 We had Frere Geoffry and Soeur Nadia with us, so they helped us through the negotiation process a little in native Fon, and we ended up with 20 small pineapple and 10 large ones. I asked the lady delivering the large ones if we could take her picture and she wasn’t big on the idea so I told her that we would buy 10 more if she would let us take her picture which she thought was a good deal. Thus we ended up with 40 pineapple for a total cost of about $6 US. We have been delivering pineapples around to everyone we can think of, and they are well received. We probably should have loaded more except that it takes quite a while to get them all delivered. In the meantime, we are eating them as fast as we can. I suppose we might get tired of them sometime but not yet. Last night I took one of the small ones, trimmed it up and then just ate the whole thing like an ice cream cone with the top as the handle. I don’t know if I could recommend that at home but here it was wonderful. We also bought some boiled peanuts from some cute little girls who were hanging around watching the pineapple negotiations. We had our usual teaching meeting with mama Carole (Julianne). Names are interesting over here. I think last week Soeur Black told you that mama and papa are titles of respect and honor as are “chef” (chief) and “Patron” (boss). In English with an African accent, that often translates to my mudder or my fodder or mama and papa. Also it is not unusual to call someone by their name of their children. Thus Julianne becomes Mama Carole simply because she is the Mother of Carole or she can be Mama Julianne because that is her name with a title of respect. It took me almost 4 months to figure out that one sister in the branch whom I knew as Soeur Pascaline was also Mama Nancy since Nancy is her daughter and everyone know Nancy. It can be very confusing. Afterwards we went to visit Soeur Nadia’s Aunt and Grandmother and Elder (Frere) Geoffery’s mother. These were pretty much social calls since they live too far out and really don’t have the possibility of coming to Church but they are really good people and we just wanted to pay them a visit. They both live in Calavie so without the elders it was a better time to visit them. We have visitied Nadia’s grandmother before so we took her some pineapple for which she was most grateful. Then Geoffry guided us to his mother’s house, which was out in the country on the outskirts of Calavie. Our last turn was down a small road, almost more like a path, to her home. As soon as we parked, two young girls came running over to the pickup with big smiles on their faces, obviously very excited to see their older brother, Geoffry. How does one try to put into words the feelings we experienced as we met the worst case of poverty we have ever seen? In spite of their humble circumstances, we were offered a dry cob of corn that the girls were preparing to be ground. As we looked around it seemed that was about all that they had, yet were willing to share and were concerned about making us happy. That night, I was a little melancholy and mentioned that I was distressed and wanted to help those little girls and their mother. The pineapple and bread we left them seemed like a mere pittance. Frere Geoffry is a little distraught because as the oldest son he is supposed to be helping his mother but is unable to do so. He pretty much let everything he had go in order to serve a mission and is trying to pick up now and get a job or some other means of support. He will probably succeed as he seems to be intelligent and served a good mission. 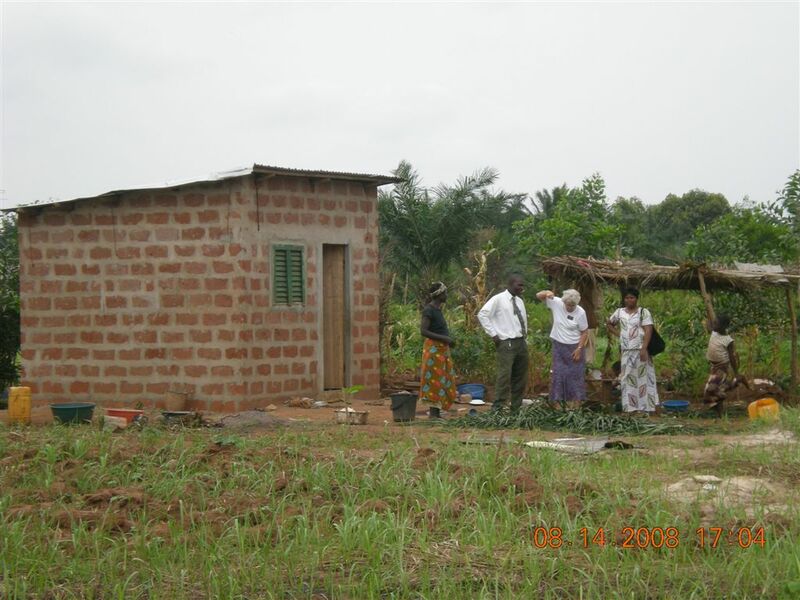 We need to describe their living conditions and environment. 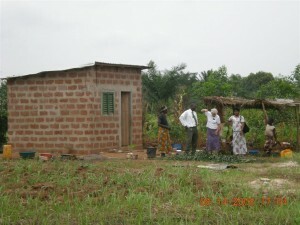 All three of them live in a small one room house about 12 by 12 feet with no water or electricity. They also have a covered area for working outside. 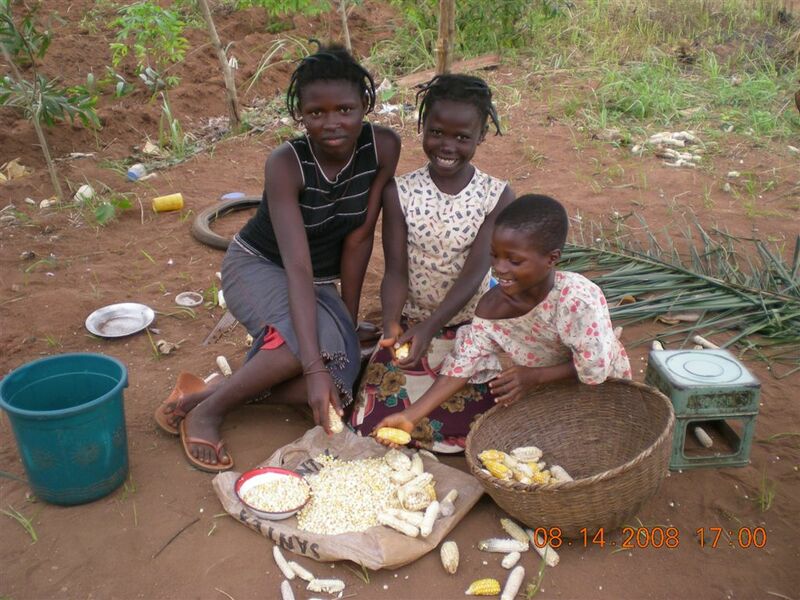 (The place where the girls were preparing the corn.) There was a well about 100 feet from their house and the water level was very deep, maybe 60 feet down. Every drop of water had to be pulled up by hand in a small rubber container. 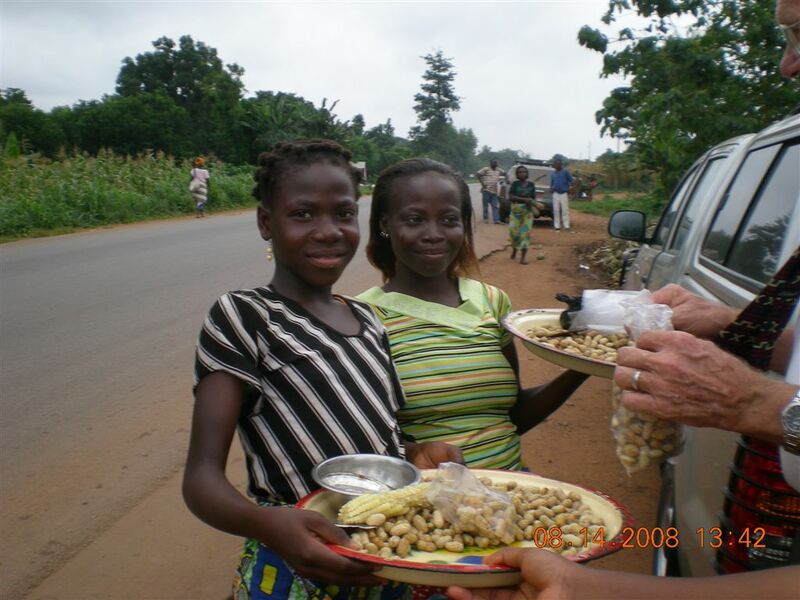 These girls did not have to fight over who got to choose a TV program, did not reject their mother’s cooking, choose what to wear to school or what to have for an after school snack. Their only concern was, “How am I going to survive today, will I have anything to eat tomorrow, is there any soap to wash my clothes with, will we be able to pay the $4.00 rent per month on our house, what happens if my health fails, etc. etc. ?” The longer we live in Africa, the more sure we become that most Americans are spoiled crybabies and we don’t exclude ourselves from that list. The things we find to complain about aren’t usually that important from the perspective of most of the people living in the world today, let alone the eternal perspective. We are grateful for our mission and the chance the Lord has given us to understand a few things like that first hand and hope that we can always remember the lesson. On Friday, the most exciting thing happened. We have been doing battle for some time to try to get supplies. The need for Bibles, hymnbooks, books, and other basic supplies had reached an almost critical level. 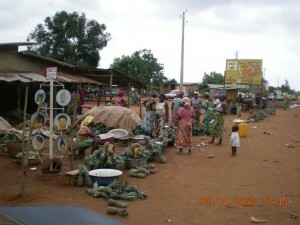 Two months ago when we went to Accra we had hoped to return with what we needed but found the shelves basically empty. Since then we have been through a complete cycle, not worth relating of how can we get things? Can we order e-mail? How do we pay? etc., always with some kind of put-off that you have to be in Africa to understand. Last Friday, Pierre arrived from Accra with two large boxes and one suitcase full to basic supplies. 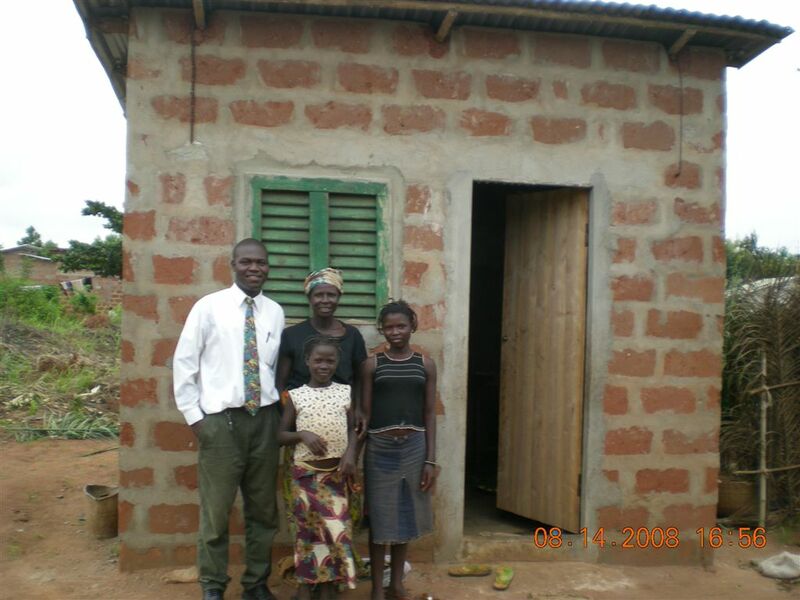 So to add to the Branch Storehouse stored in our apartment we are now also the proud location of the Benin Church Distribution Center. We are making progress and things are getting better.